At the time of writing this Kid Icarus: Uprising review, I was unable to get a Circle Pad Pro. It turns out the entire metropolis of Portland, Oregon is sold out. If the peripheral is able to remedy the game’s frustrating controls (see below), I’ll reassess some things and adjust the review. The term ‘blast from the past’ has never had quite so much a meaning as it does now. In the past two decades, we’ve seen so much advancement not only in video gaming, but in technology in general. Developers and game companies have risen, and fallen. The art of the video game has transitioned from two dimensions to three, and the industry has taken incredible leaps and bounds from ‘creepy basement pastime’ to ‘mainstream entertainment activity.’ And in a move of pure revival, Nintendo—perhaps the largest and most successful game company of them all–has brought back one of its classic franchises. 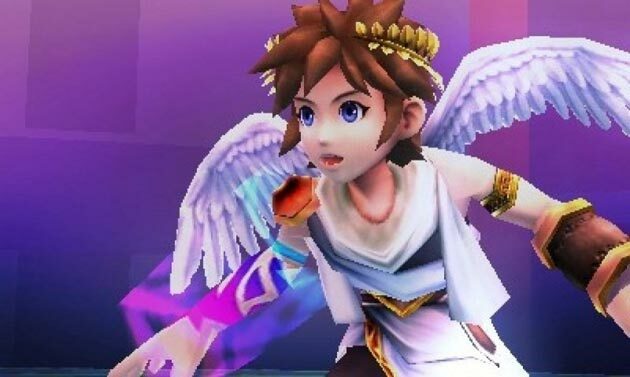 The Kid Icarus series—last seen on the original Game Boy–soars up and out of a twenty-four year stasis, and lands in the present as one of the best-looking, but ambitious games in the 3DS’s library. Kid Icarus: Uprising marks the third entry into the series. While the original two games were vertically-based platformers, Uprising is a fast paced, action-heavy third person shooter. 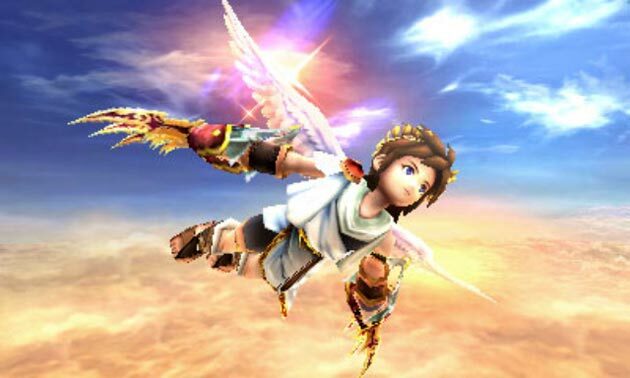 The game features the return of Pit, the boy angel who hasn’t quite mastered the art of flight. The Queen of the Underworld—Medusa–has been mysteriously revived and it’s up to Pit and Palutena, Goddess of Light, to end her once again. The entire series has undergone a massive redesign. 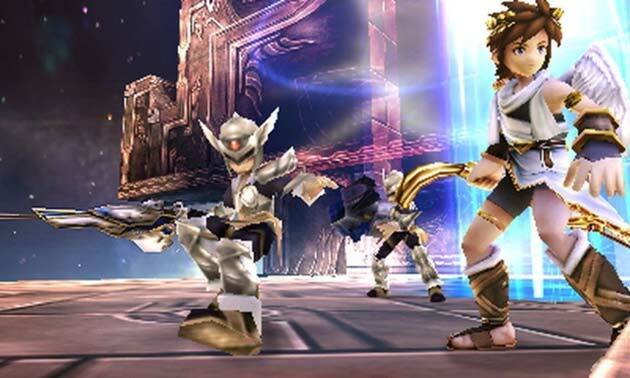 Pit’s and Palutena’s character models are straight from their appearances in 2008’s Super Smash Bros. Brawl, and every other character from the original Kid Icarus title have seen heavy changes as well. Uprising also debuts a new character, named Dark Pit. 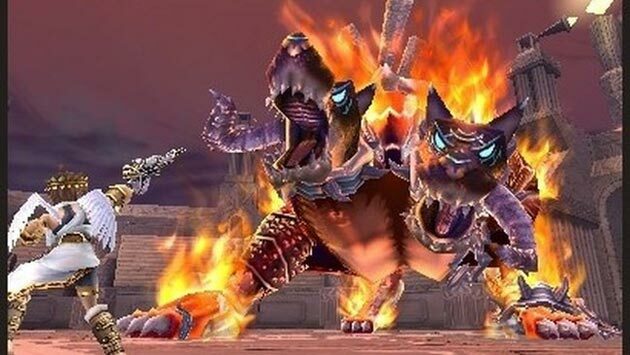 His design is based on a palette-swap of Pit’s from SSBB. Fortunately, the new designs are entirely consistent with the game’s light hearted and (at times) hilarious writing. Uprising’s writing is a departure from the Nintendo norm. The in-game characters frequently break the fourth wall and reference real life pop culture and other Nintendo franchises. The characters are also genre savvy, and are fully voice acted. In one conversation, Palutena is briefing Pit on a dangerous boss battle that lies ahead, to which he replies, “So, what are we talking here? Mini-boss? Final boss?” This reviewer admitted a laugh to that exchange. 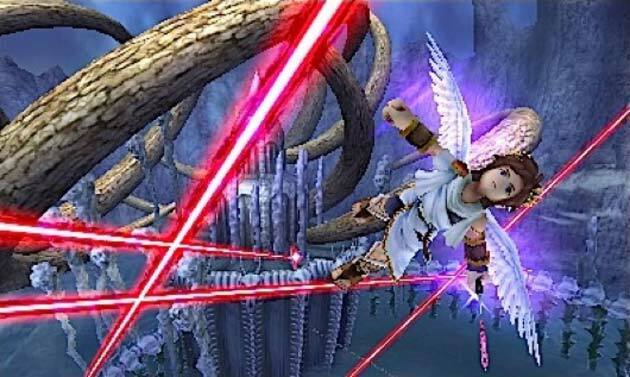 Gameplay in Kid Icarus: Uprising is split into two styles: Air battles and land battles. Before each mission, the player is presented an option of adjusting the difficulty level. This feature is called the Fiend Cauldron. The player can spend hearts (in-game currency) to lower the difficulty, or bet hearts and raise it. Choosing the latter causes enemies to drop more hearts, naturally. During air battles, Pit is granted the ‘Power of Flight’ by Palutena—meaning she controls his flight path, allowing you to focus on attacking and dodging. This is where the game is at its best. Land battles are an acquired taste, however. Kid Icarus: Uprising does feature super high quality production values, but ultimately suffers from one fatal flaw: controls. I wanted to give this game a 5 star rating, but when a control scheme is as awkward as Uprising’s, the game’s experience as a whole is diminished. The top screen is where the game’s action takes place, and the bottom features character artwork during dialogue scenes. You control Pit’s movements with the analog stick, and fire with the L shoulder button. You aim the top screen’s cross hair with the stylus on the bottom screen. To adjust the camera during the game’s on-foot sequences, you flick your stylus across the touch screen. Sound confusing? It is. So much in fact, that each copy of the game ships with a stand for your 3DS. The game is nearly impossible to play without said stand. To be fair, this method of control actually works during the flight segments. This is because the camera is controlled for you. On land, however, the camera controls are just abhorrent. Even with the stand, frantically flicking across the touch screen just to see where you’re being attacked from feels clumsy. Adding a lock-on function for the top screen’s cross hair would have helped immensely, especially with camera control. Land battles feature the inclusion of three different vehicle types—a tank/car combination, a mech, and a spherical piece of armor. While the latter two vehicles handle surprisingly well (especially the mech), the tank’s handling is downright sloppy. Trying to control the camera while keeping the vehicle moving forward is a feat in and of itself, and if you can actually master it, kudos! Speaking of in-game dialogue, the majority of conversational exchanges between characters occurs during combat. While listening to each character’s snarky comments is a treat, much of the story is told through this manner, and paying attention to it too much can easily get you killed. In short, dialogue is completely distracting from the on-screen action. The atmosphere Kid Icarus: Uprising presents goes hand-in-hand with the redesign and tongue-in-cheek humor found throughout the game. The art direction is phenomenal, and truly brings the in-game world to life. Throughout the flight segments, you’ll gaze at the beautifully crafted background scenes—from an enormous city, to the middle of the ocean, to over a war being fought below. These scenes just pop through the 3DS’s 3D display, and the developers should be commended for that. Something I loved was how the cartoony design of the game’s standard monsters created a counterbalance to the realistic environments you fight through. One aspect I thought was really well done was how Uprising incorporated multiplayer into the game. Dubbed as ‘Together Mode,’ multiplayer is split into two different types of play: ‘Free For All’ and ‘Light vs. Dark.’ Free For All is exactly what you’d expect—six players engage in a fun and frantic battle royale. For every player you knock out, you receive points, and you lose points if you are knocked out yourself. ‘Light vs. Dark’ is fairly unique. Again, six players engage in a battle, but this time three players at random are on the ‘Light team’ with three on the opposing ‘Dark team.’ Each team represents Pit or Dark Pit respectively. 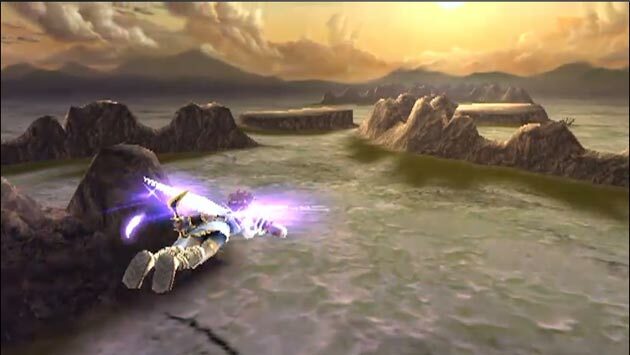 Although you’ll keep respawning if you’re knocked out, the last player to get KO’d is transformed into either Pit or Dark Pit, depending on what side they’re playing. As you might expect, each is more powerful and quicker than the standard multiplayer characters. I found Uprising’s critical control and camera issues to be far less hindering in multiplayer. This is because the game’s multiplayer maps are completely open in level design, as opposed to some of the tight corridors you encounter in the single player experience. The replay value of Uprising is actually fairly high. In addition to the aforementioned multiplayer, there are tons of unlockable ‘idols,’ much akin to the trophies found in the Super Smash Bros games. One of my favorite features the game has to offer are collectable, real-life AR cards. These are found through many different ventures (gaming magazines, Nintendo events, and each copy of Uprising ships with six random ones). The game has an AR Mode from its main menu, which allows you to view each card through the 3DS’s Augmented Reality camera. The character depicted on each card comes to life, which unlocks idols in the game. You can also have them battle each other, making for a sweet time killer. Lastly, Uprising features a StreetPass function in the form of gem-swapping. Said gems contain weapons you can trade and receive from other players. Kid Icarus: Uprising is a game that should be better than it is. It features astronomical production values, even by Nintendo’s standards. However, all the quality soundtrack, voice acting and graphical power in the world can’t redeem it from its purely counter-intuitive controls and sloppy camera control. If you can overlook the game’s criminally poor controls, then consider this one of the best titles on the 3DS (or any handheld, for that matter) and pick it up. If not, well there’s not much else to say. it seems to be very modern to say kid icarus got a horrible steering, which is just not true. different does not equal bad. it’s all about the human brain. there are brains that are slick and there are brains that can only do what they’ve known and change is bad. instead of bashing a control scheme one is not familiar with, article writers should praise the fact that this is the control scheme that fits the handheld the most. i am missing fingerpoints to crapcom who brought their circle pad addon because they did not want to spend resources by implementing this control scheme into their monster hunter or revelaitons (pun) and rather put out a questionable hardware addon. And while the game as a whole is fantastic (the above review mentions that), I personally found the controls to be clumsy, hampering, and at times, painful. Different doesn’t always equal bad (case in point: The World Ends With You). In this game’s case, different means distracting from the wonderful experience presented by its high-end production values. It really is a well thought-out control style; but it still is uncomfortable and clumsy. To me, anyway.